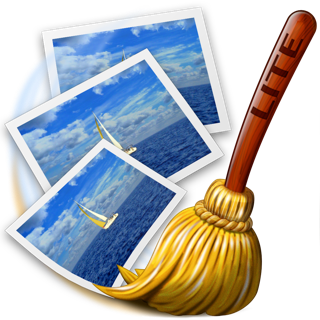 PhotoSweeper is a fast, precise & super efficient tool to eliminate similar or duplicate photos even in huge photo collections. 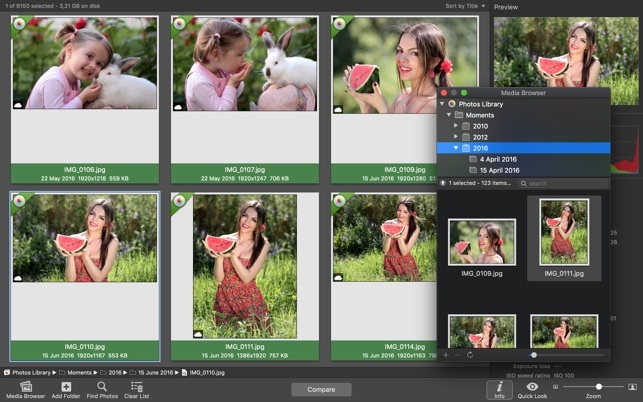 It works with Photos, iPhoto, Aperture, Capture One and Lightroom media libraries as well as photos from your hard drives and external storages. • You take a series of shots of the same scene trying to get the perfect one. 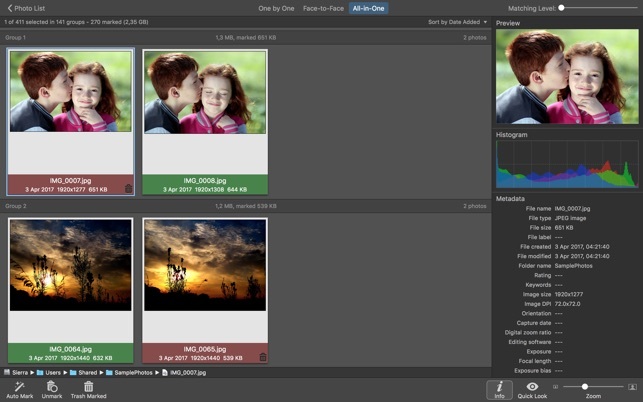 • You edit photos with software like Photoshop, Pixelmator etc., and make backups just in case. • You have photos scattered on external hard drives and local disks, in Apple Photos, iPhoto, Aperture or Lightroom libraries. • You have a mess in your photo collection or just want to free disk space by removing junk photos. 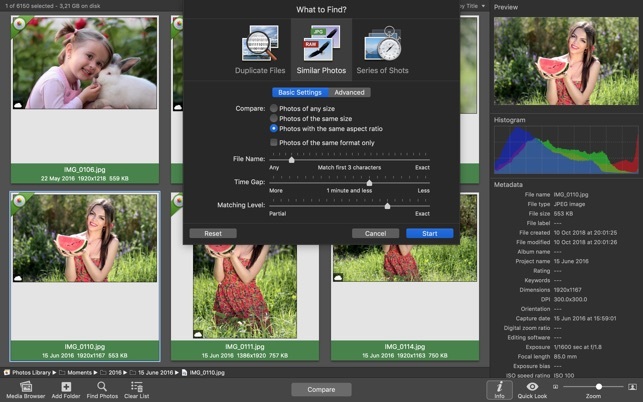 Just drag and drop folders from your Mac to allow PhotoSweeper to find all photos inside. Add more photos from your Photos, iPhoto, Aperture, Capture One or Lightroom library via the Media Browser window. 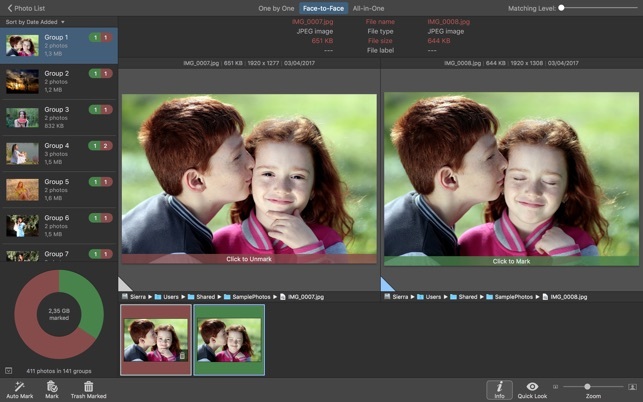 Powerful multi-settings to easily find duplicates, similar photos, series of shots. 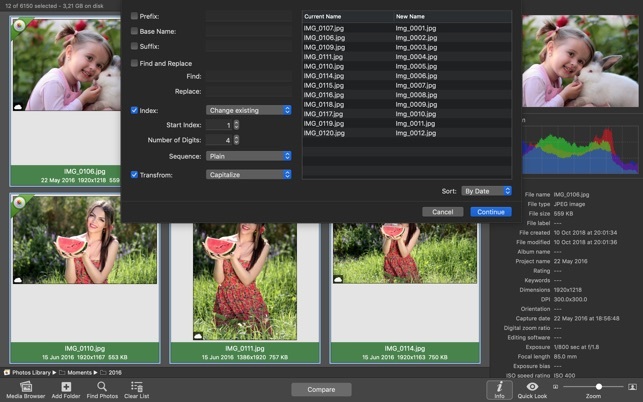 The app finds duplicate photos, even those edited in external programs such Photoshop, regardless of image size or format. Find duplicates between two groups of photos while ignoring those inside each group. 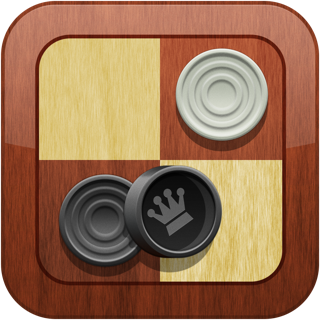 It allow you to compare the contents of two folders with each other or find similar photos to a single image. 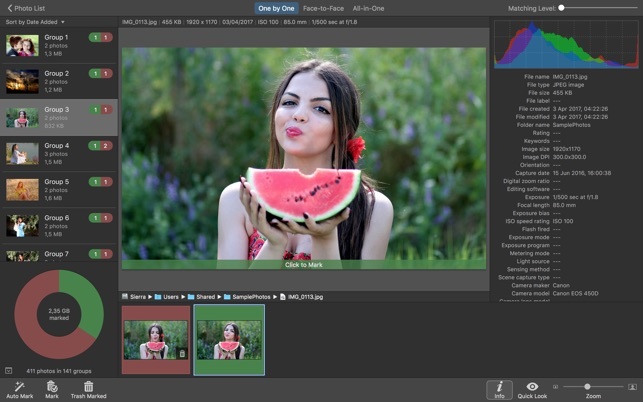 PhotoSweeper was developed as a tool for extremely fast comparison of a huge number of photos. 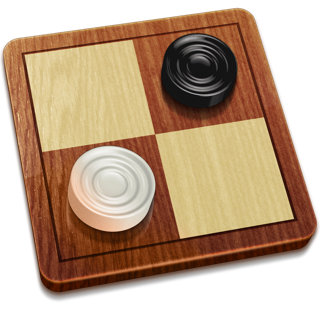 Cutting-edge technologies and unique algorithms make searching duplicates incredibly fast and gives excellent comparison results. You can regroup the results without re-comparing photos by changing matching level with a slider. Using caches makes the next comparison much faster. Mark photos you want to get rid of manually, or use the "Auto Mark" feature to mark duplicates automatically based on the list of rules you can adjust to your needs in the Preferences. 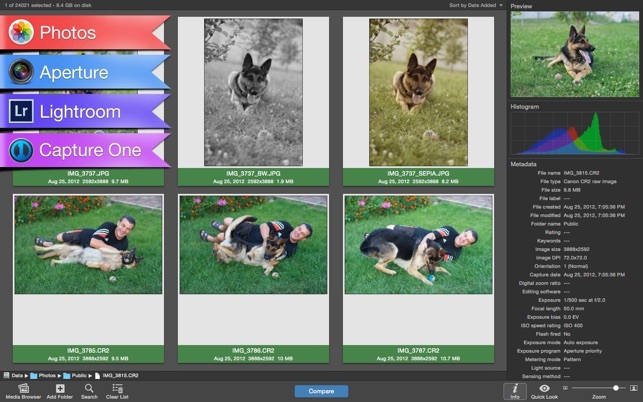 PhotoSweeper provides 3 modes for reviewing results: “One by One”, ”Face-to-Face" - one or two large photos with an opportunity to mark a photo with just a click, “All in One“ - all groups of duplicates in one list. 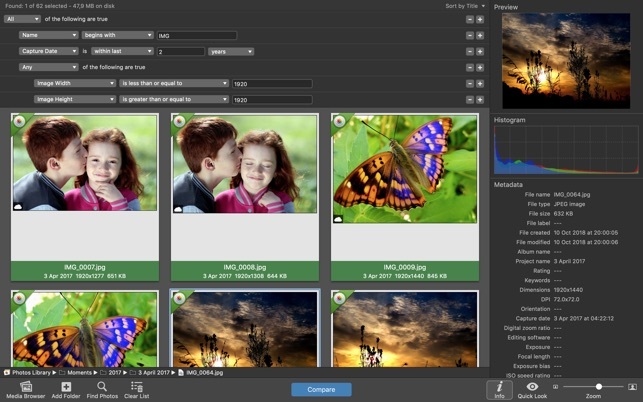 PhotoSweeper also serves as an up-to-date photo browser with a built-in search of photos by metadata, Quick Look preview, the "Info" panel with a detailed photo description, including histogram and image metadata (EXIF, IPTC etc.). Introduced full support of macOS Mojave. Mit PhotoSweeper endlich die Mediathek aufräumen. Der Vorteil ist, dass im Gegensatz zu anderen Tools, nicht nur Dateigrößen und Dateinamen verglichen werden, sondern tatsächlich das Bildmaterial und die Bildähnlichkeiten verglichen werden. So finden sich leicht mehrere Bilder desselben Motivs oder Varianten von unterschiedlich bearbeiteten Bildern. Funktioniert tadellos ! Übersichtlich und zuverlässig. Geld wert.